Ever since the establishment of CTBC International Academy, we have devoted our best to our meals which aim to achieve hygiene, nutrition and healthy life styles. 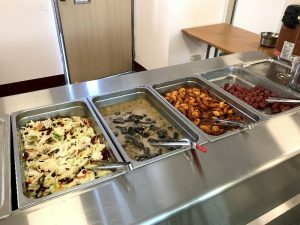 The concerns include 1) Nutritional Balance 2) Student Consumption 3) Preparation and Cooking Time Needed 4) Amount for all 800 people including College Department. 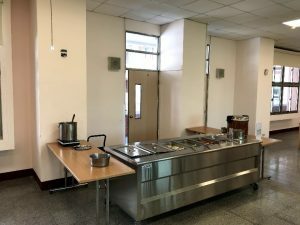 The central kitchen offers meals four times a day, including breakfast from 06:00 – 10:00; lunch from 12:00 – 13:30; snacks at 15:00 and dinner from 17:00 – 18:30. We dedicate our best to the preparation of our meals and we care about health very much. Therefore, we are very particular about the water and oil. In terms of water, it comes from the drinking water system, and it can be drunk directly. Next, all the oil we use has passed the national standard and comes from a trustworthy source. We use sunflower oil to pan-fry the vegetables and the cost is 35% more than average restaurants. Additionally, to get rid of pesticides, chefs will wash produce many times and rinse them with running water. After the snack in the afternoon, chefs have to clean all stoves, range hoods, walls and even drains. 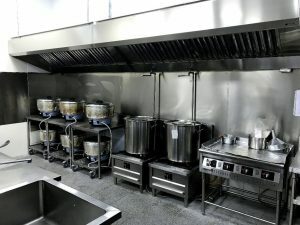 Although all the equipment is carefully washed every day, it still needs sterilization. For that reason, every Friday at 15:00, all kitchen staff will focus on cleaning the kitchen with bleach. CTBC International Academy conducts all details to perfection on a daily basis. This applies to not just the curriculum and architecture but also our meals. We believe our students can grow up happily and contently.